Due to increased interest we are bringing back this product line. Please check back regularly as we add more items! Wall To Wall Storage Solutions is proud to announce the arrival of our new Tack Room Storage Line "TackRacks Plus". Whether for personal use or commercial display this system presents the ultimate in tack room storage. Designed to work with storeWALL slatwall or similar product, you will not find a better system on the market. 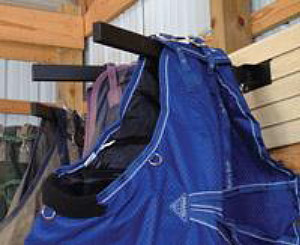 This versatile system can be mounted in commercial locations, horse barns, trailers, showrooms or anywhere else you need to keep tack items close at hand. So go ahead impress your customers, riders, neighbors, friends, and even your horse. Show them that you care enough to provide the best!